Article courtesy of NCWC Media - The Republican Reporter: Renee Shreve. Photo credit to Jay Moyer., GC Public Works Director. A portion of the Accident-Friendsvile Road, commonly known as Limestone Road, will be closed to the public and will no longer be part of the county’s system of roads. A public hearing on the issue was conducted last week by Garrett County commissioners during their regular session. No one opposed the closure, and it was unanimously approved by the commissioners. 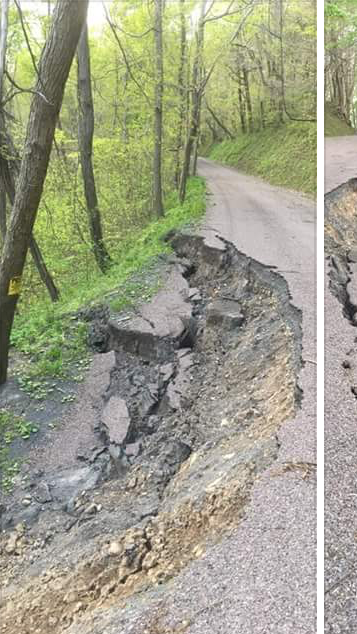 “Due to a landslide and the resulting unstable conditions associated with the slide, a portion of Limestone Road has been closed to the public on an emergency basis,” county administrator Kevin Null explained at the beginning of the hearing. He noted the county determined that it was not economically feasibly to repair the road in the slide area; therefore, a petition was initiated to permanently close it in order to protect the health, safety, and welfare of the public. The authority to do so is granted by the state. Located near Friendsville, Limestone — a narrow, curvy dirt road with steep drop-offs — is not even listed on most maps. It does, however, pop up on some GPS systems and offers an adventurous drive for unfortunate motorists not familiar with the local area. The section to be closed encompasses 5,715 feet from Deere Road to property located at 4501 Accident Friendsville Road, Null said. There are barriers already installed at the beginning and end of this section, since the county does not maintain it during the winter months and closes it to traffic. A property owner who lives in the soon-to-be-closed portion of Limestone asked if the barriers would remain. He noted that, in the past, people have broken through the barricades and trespassed. Null also noted that the rights to the road will revert to the nearby land owners. Commissioner Paul Edwards indicated the county would work with Limestone residents in finding a “comfortable” solution to providing them access to their land and keeping out the general public and trespassers. The official closure will take place in 30 days, according to Null. Land owners who have questions about the road can contact Moyer at (301) 334-7480. The commissioners’ next public meeting will be held on Monday, July 17, at 5 p.m. at Friendsville Town Hall.